After school I accepted a job in sales — direct sales — and worked my way up through the ranks to a management role in recruiting. Unfortunately, this meant doing a public presentation (twice a week) for each new batch of recruits. It was one of the hardest things I had ever done. I still remember the lost nights of sleep before each of my presentations. The bottom line was that, while I clearly had things to say, I was terrified of public speaking. Years later, running my own IT company in England, I was invited by Mike Berry to do a presentation at the Scotland branch of the Yes Group. Since it was six months away — and because it was a topic I was really passionate about — I agreed to do the talk. Some years ago I was invited to speak at a conference in Seoul to talk about 3D production because of our company (Kerner 3D Technologies) in California. The producers flew me (in business class), our equipment and one of our engineers out to the event. In other words, they paid us to come out and advertise our brand and create attraction for our business. Nice. I was invited to speak at a pre-Olympics event in Vancouver, Canada. They asked me to speak on film production, storytelling, visual effects and 3D production. As a result of my presentation, we secured funding for a film we were producing at the time. Oh, and I was then invited back for an all-expense-paid trip back to the Olympics that included tickets to the Gold Medal hockey game! 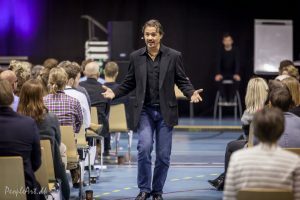 Germany: Recently I was the opening speaker at a large business event in Hamburg where I was one of only two English-speaking presenters; the other was Sir Richard Branson. London: Two years ago I had the privileged opportunity to follow President Bill Clinton at an event at Docklands. Tony Robbins: One day I got a call asking me to appear as a guest speaker at Tony Robbins’ Business Mastery program. As a big fan of Tony’s, I found the request both exciting and, frankly, a bit nerve-wracking. That initial appearance, in Fiji, led to more than a year of touring with Tony and doing events in Australia, America, England and Fiji. One day, after having lunch with Tony at his house in Fiji, Elise and I reflected on how far I had come from my being afraid of public speaking to, well, this. How did I overcome the nerves and fear and, then, become comfortable with and confident about public speaking? How did I learn the skills required to be a professional level speaker? Lets start at the end, because with a strong enough “WHY?” it seems like just about anything is possible. So, Why did I do it? What do you have to say and why do you want to say it? Who will it help and how will it help them? What will it do for you to find your voice and share your message? How would you feel inside if you didn’t find a way to share your message? In my case, I knew that I had distinctions to share in a variety of areas of life. I knew — from my one-on-one client coaching sessions — that my message was strong and has a lasting and powerfully positive impact. I knew that when I was a catalyst in a person’s life — when I gave them that extra spark, skill, tip or perspective that leads to an improved quality of life for them — I felt outstanding. Tony Robbins asked me once — while coaching me on my presentation — what I loved the most about speaking. While I have a number of answers to that question, the loudest answer in my head was this: When people write to me — weeks, months and years after hearing one of my talks — and tell me stories about how something I said marked a turning point in their business or personal life. I love that. It fills me up. And, when I don’t get to do this work, I feel empty. Years ago I took a break from speaking to buy a film studio in California. Yes, it was fun. Of course it was challenging and interesting. And it prevented me from doing what I really love — sharing potentially life-changing ideas, distinctions and perspectives with as many people as I possibly can. At this stage, since you have read this far, I am going to assume that you already have a pretty strong WHY for wanting to speak so lets move on. 1) How important is your message? The more important your message is, and the more you know your stuff, the less nerves you will feel. In fact, if you truly believe in your message, you will have some passion about getting it out there. And passion goes a long way toward overcoming nerves. So, before you give a talk, give some serious thought to the value you plan to create for the people or organizations for whom you will be speaking. Does your message really have the potential to create significant positive change? The movies (pictures, sounds, feelings) you create in your body feel very real to your nervous system. This is why a scary movie can actually scare you; you know that it isn’t real but your nervous system doesn’t. In fact, try swimming in the open ocean and then having a quick thought about large sharks… for many, that one thought will get them out of the water even though the sharks were only ever in their head. Horror Films: This is when you let Stephen King direct the movies in your head. If you are seeing things going badly — no response from the audience, forgetting your talk, no laughs, etc. — then you have allowed Mr. King take over. And you will, as a result, feel nervous. Feeling nervous will make the movies more intense which will, in turn, make you more nervous. And the loop continues. Hero Films: If you see your talk going well — laughs and smiles, warm faces, standing ovation — then you have a much better director in charge of your mind movie. and the result will be that you will feel much better. This may sound overly simple, but it is completely true; it may take some effort to force your mind to shut off the Stephen King movie, but once you do, you will feel so much better. What would I have to do to feel excited right now? What am I most excited about as I prepare for my talk? What are some of the the amazing outcomes that could come out of my presentation, and why am I so excited about them? With nerves and excitement out of the way, lets talk about skills. Body language has a surprising impact on the audience and on the meaning and intensity of your talk. Shockingly, many of the normal hand movements people use when they speak in public deliver subconscious messages to the audience that the speaker is lacking in confidence or not very certain about their material. While I will address this in more detail in our online training, for now it is enough to know that one important skill you can learn is to not use your hands when you talk. By learning to speak without moving your hands, you can then learn to use them deliberately at key moments and to communicate specific messages. It is really important — and perhaps obvious — to know whom you are addressing. At the basic level, this means that you know your audience and match your message to that audience. At a more complex level it is important to understand that there are a variety of listening and learning types, and that your talk should appeal to as many of those different learning styles as possible or else you will lose rapport with large sections of your audience. Visual — People who will make pictures in their heads as they listen to your talk. Auditory — People who will pay close attention to your words, the sound of your voice and will probably have self-talk in their heads while you are speaking. Touch — People who will constantly check in with themselves to see if your message feels good to them; they will do continual ‘gut checks’ to see how they feel. While people will not always fall cleanly into one of these groups — some people will use two or all three — it is fair to say that most people feel more at home with one of these listening styles than the others. For someone who is firmly visual, a very ‘feeling’ based presentation may well drive them crazy. On other other hand, a touch-based learner, or someone who is more sound sensitive, may find the pace of a fast-talking and loud visual presentation to be simply too much. b) Your Tone and Tempo — Your voice qualities can be more gentle (auditory) or faster and louder (visual). “Do you see what I mean?” — Which might be more appealing to the visual listeners in the group. “How does that sound?” — Which might be more appealing to the auditory listeners in the group. “How does that feel to you? — Which might be more appealing to the kinesthetic members of your audience. I don’t build presentations in the traditional linear fashion; I build ‘sets.’ If you were to ask the Rolling Stones — assuming you could afford them — to do a concert for your company, would they need to rehearse? No. They would not need to rehearse, because they would simply build a set from songs they already know incredibly well. I teach my clients to build their talks the same way: to build a presentation as a ‘set’ of stories and examples that they know extremely well. I do this for a variety of powerful reasons, including making it easier to remember your presentation, and, perhaps even more importantly, making it easier to be flexible in the length of your presentations. Many speakers — even top professionals — get very upset when they are asked to shorten their programs. Sometimes this is just about ego; they just love the stage time too much! Mostly, however, it is about not knowing how to shorten the talk because they have built or gotten used to delivering a very linear presentation. Instead, if you build ‘sets’, you can instantly add or subtract time by (a) telling the stories in shorter or longer formats or by (b) adding or removing entire stories. I sat preparing, once, for a talk in Manchester, England. The producer approached me, somewhat nervously, and explained that there was a mix-up with the lineup and that my 45 minute talk would now have to be 30 minutes. “No problem,” I told them. The producer was surprised — he expected, at least, a mini tantrum, but instead he got a cool, calm professional reaction. Then, while I was on stage, when I had about 5 minutes left on the clock, the clock changed and said that I had 15 minutes to go. I carried on. And then, with 5 minutes to go again, the clock changed and gave me 30 more minutes to go. All told, my talk ended up being 90 minutes long because the speaker due on stage after me had missed a flight and the producer didn’t know what to do. a) Because I had built my talk as a set and could simply add in new stories and examples, the audience never knew that anything was wrong. It was not obvious to anyone that my time was tripled while I was on stage. b) The producer was blown away. First, by my cool acceptance of a shorter talk and then second, by my even cooler acceptance of the liquid situation that took place once I was on stage. Remember something important: If you have been booked to speak at an event that someone else is producing, the audience is not the client, the producer is. By using ‘sets’ you can make yourself much easier to work with and producers love to book speakers who are easy to work with. Inceptive Stories are stories that are so engaging that your audience, or prospects, want to hear them. They are stories that subtly move your audience to a new realization or paradigm shift that they both want and need your product or service.And they are stories that convey to your audience that they should really buy from you rather than someone else. a) Make sure that your story is both valuable (informative) and engaging (entertaining). b) Make sure that you provide statistics and data that are well researched and sourced, so that you can establish powerful credibility and authority. c) Make sure that you tell an effective Origin Story that will tie the audience into your passion for your subject. d) Make sure that you share your Investment Story with the audience so that they know you are speaking from experience rather than from something you read or heard from someone else. d) Make sure that your story includes excellent advice about how to get the solutions they are looking for and where NOT to get them (your competitors). This is called setting Buying Filters. There is an art to designing and delivering a powerful Inceptive Story and you can learn more about Inceptive Stories at www.InceptionMarketing.com. While I was terrified of public speaking, I also enjoyed telling stories. Being a good storyteller is a great start, but it does not replace the need for professional training and practice. My general rule of thumb is that you should not use a story on a professional stage until you have told that story at least 100 times. You should know the story so well that you know the right timing and cadence, and, if you are interrupted, you can jump right back into the story. Practice, in this case, really does make perfect. And then, once it is perfect, you can break it out on stage — but you must do so in a way that it does not sound perfect. Yes, it is a tad ironic, but you want to know your story so well that it is perfect, and you then want to deliver it as though it is fresh. Again, this is an art form, but a very powerful art form. a) Learn from someone that was not a natural. If you learn from someone that always found it easy, they will not be as effective a teacher because they had so much less to overcome. b) Learn from someone with real-world experience. 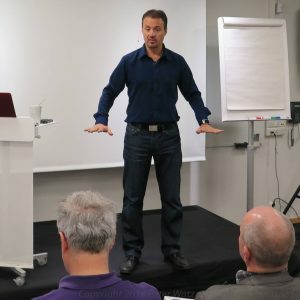 There are a variety of speaker trainers that teach programs about how to make millions of dollars as a speaker while they are struggling to pay their own bills. Get training from someone with real world results. Anyone with real skills will be more than just a trainer; they will be recognized as a sought-after speaker and it should be easy to see this on the web. c) Learn from someone who is getting the results you want. If you, for instance, would like to speak internationally, make sure that your trainer has experience with international events. There are a variety of differences from country to country and having a trainer that can address these things is a must if you plan to speak internationally. Further, if you plan to speak to promote your business, learn from a trainer with real business experience. Many professional speakers (and speaker trainers) have plenty of experience running their speaking business but not with running a normal business or, for that matter, using speaking to promote a normal business. 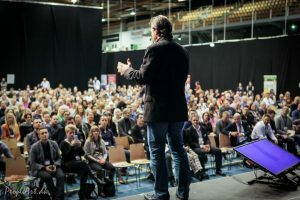 They speak at personal and business development conferences whereas you may want to speak at professional or trade conferences, That is not an insignificant difference! d) This last item of advice may seem somewhat self serving if you have read this far, but only get training from someone who has taught you a great deal before you even signed up for their training. Don’t let a trainer’s marketing pull you in with vague promises of results: if they teach you something (through a webinar, seminar, book or even a blog like this one) then you are on the right track. e) And here is a shameless plus; get free online training if you can! Lastly, don’t do this alone. Get together with other speakers and aspiring speakers — compare notes, share contacts and collaborate. Just in the past few months one of my favorite clients (and supplier of services) has introduced me to a number of new events, one of which will have me speaking for four days to over 5000 people. Put together a great peer group, and help each other make it happen.